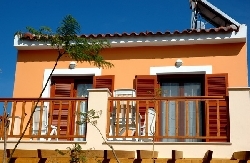 VILLAS AND APARTMENTS TO RENT ON THE AEGEAN ISLANDS. 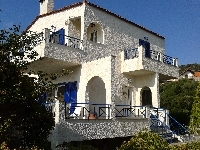 Welcome to our selection of holiday homes to rent on the Aegean Islands, Greece. The Aegean Islands can be found between Greece and Turkey in the Aegean Sea. Crete is the most southerly of the islands and also the largest. The islands here are typically split into seven groups and these are as follows: the North-eastern Aegean Islands, which consists of Lesbos, Lemmons and Samos. The Sporades has a total of 24 islands, however only four have permanent inhabitants and these are Skiathos, Skopelos, Skyros and Alonnisos. Euboea is the second largest island in the overall grouping of Aegean Islands and has a shape that is similar to a seahorse. The Argo-Saronic Islands include Salamis, Poros, Angistri and Aegina, while Cyclades has a massive 220 islands in total and major ones here are Andros, Syros, Melos and Naxos, to name just a few. The Dodecanese, or Southern Sporades, are home to the islands of Rhodes, Kos and Patmos, however there are 12 larger islands in total with an additional 150 smaller ones included in this grouping. Finally there is Crete, which has already been mentioned; is the largest of all the islands and along with a few of the others mentioned is a very popular holiday destination. All of these Greek Islands have something to offer holiday makers, from ancient ruins and medieval castles to buzzing nightlife and bars galore. It all depends on what you want and most of the largest islands can accommodate a wide range of tastes. Crete, for example, has a wonderful range of landscapes from fabulous beaches to mountains, valleys, rivers and gorges. Although places like Crete, Rhodes and Kos are the well known Greek Islands, it is well worth investigating some of the other islands; they may not be as commercial as the more common holiday destinations, but this will ensure you have a more authentic Greek holiday. Also you are likely to find a beautiful place which has everything you want for a fraction of the price of the more commercialised islands. Skiathos and Alonnisos in the Sporades are excellent examples of this. 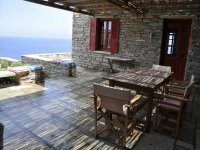 Looking for self catering holiday accommodation on the Aegean Islands? 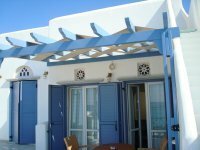 Then below is a selection of apartments on the Aegean Islands and villas on the Aegean Islands that can be rented direct from their owners. You can either click on each listing for further details or you can use our search engine on the left if you are looking for something in particular. The Aegean Islands do not get much tourism, so it�s fairly untouched and has very well preserved monasteries, ruins and ancient architecture. The Aegean Islands are fairly mountainous and unlike a lot of other islands in the area, they have a lot of vegetation, forests of oaks and olives with waterfalls and rock pools to be discovered along the way. Samothraki has the highest peak in the Aegean islands, Mount Fengari which stands at 1611 metres, offers an amazing view. With the lack of tourists the beaches are often bare of people, allowing a quiet, relaxing holiday. Ferries between the islands are easy to find and each offer some fantastic things to see, with both archaeological and cultural sights. In Lemnos you can see things ranging from a 22 million year old fossilised forest to the fourth millennium BC settlement of Poliochni. There is very unique sights to be seen, that can't be seen anywhere else in the world. Take a trip to Samos, a small tranquil island with very untouched beaches and famous for its olives and wines. Its town is a sight too, featuring mansions, twisting alleys and ancient churches. The general climate in this area is classified as Mediterranean, which means it has hot dry summers with mild to cool winters. Crete�s temperature ranges from the high 20�s to low 30�s during the summers months, but they can reach as high as the low 40�s. Skiathos, which is in the more northerly section of the island grouping, has average summer temperatures ranging from the low 20�s up to the mid to high 20�s. The Aegean Islands are a group of islands located in the Aegean Sea. Mainland Greece lies to the North West, whilst Turkey is to the east. The island of Crete is located south from the islands.